Storing food for an emergency, whether it’s the everyday kind or a truly life-threatening emergency, is just a smart idea. We need food to live so we should have food stored in our home. 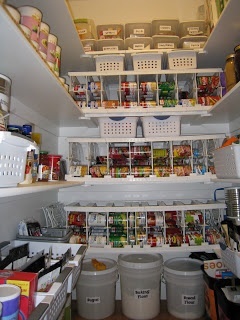 If you’ve decided to build up your food storage, one of the first questions you probably have, though, is “where in the world am I going to put all that food?!”. Fortunately, even if you don’t have a lot of space, you can get creative when it comes to where you put your food storage. A basement cold storage room is an ideal place to store your food storage. Basements are naturally cooler than the rest of the house and a cold storage room build beneath a front porch provides some extra insulation. I was lucky enough to have an unfinished cold storage room in my first house and it was so nice to have a designated place to store my food storage. For your long term food storage that you don’t need to access everyday, look for wasted spaces in your house, even ones that are not overly accessible. You can store food under the beds in your home, in the tops or bottom of your closets, or in gaps behind furniture. I’ve even known people to create tables out of food storage by stacking boxes then throwing a table top and table cloth over the top! The Under the Bed Food Rotation System from Thrive Life makes it easy to rotate the food you have stored under your bed if you don’t have a lot of accessible storage. 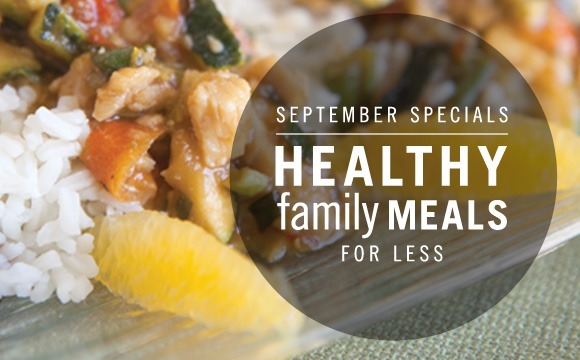 Don’t forget you can buy that at a discount if you host a party or sign up as a Thrive Life consultant. Just be sure and keep an inventory of what you have where and when it was purchased or expires so you don’t have any food waste. Storing emergency food doesn’t do you any good if you can’t find it when you need it. If you live in a climate that has a fairly mild climate, you can store food storage in your garage. Extreme heat will deteriorate the quality of your food so if it gets hot where you live you may want to opt for another storage option. 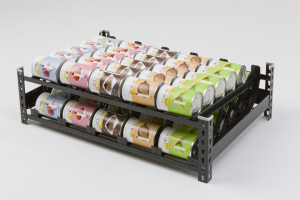 Sturdy shelves make it easy to organize your food storage in a way that is easy to rotate. I like shelves from Gorilla Rack because they are extremely strong but they also come apart if you ever need to pack them up a move. Place shelves as far away from your garage door opening as possible in order to maintain a steady temperature and keep your shelves out of direct sunlight. Organize your food by food group and be sure and put the oldest items on the front of the shelves so they can rotate them. If you have the space, the Thrive Life (formerly Shelf Reliance) food rotation systems are amazing and really simplify your food storage organization. 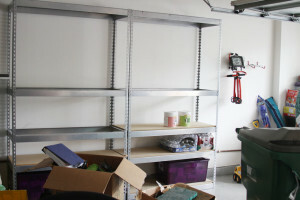 I have one on my wish list but until then we are working on organizing our Gorilla Rack shelves with all the basics. We moved into a new home in January so our food storage organization is a work in progress. We outgrew our smaller Gorilla Rack shelves as we’ve built up our food storage through Thrive so last weekend it was time to set up the big shelves. I’ll have an update on our personal food storage organization project as we get further along in the process. I’m always happy too see progress towards our emergency preparedness goals even if they come in small pieces. If you don’t think you have room to store food, look around your house and decide if anything you are storing is clutter. By getting rid of things that aren’t necessary, it leaves you room for the things that are. As an added perk, if you sell some of those things that you no longer need, you’ll not only be making room to store your food storage but you can earn money to pay for it as well. 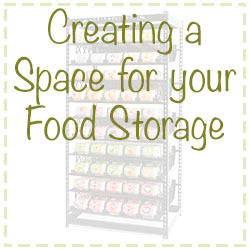 It’s always important to leave room for growth in your food storage organization plan. Most of us don’t start with an entire year supply of food at once — it’s usually something that grows over time. This may mean buying an extra shelf so you have some place to put food storage and emergency supplies as you have the money to buy it. It may mean planning for creative ways and places that you will store supplies as you build them up. Whatever your plan for food storage, there is always a way to store food for an emergency, no matter how much space you have (or don’t have). 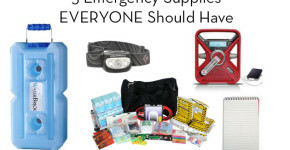 Where do you store your food storage and emergency supplies?